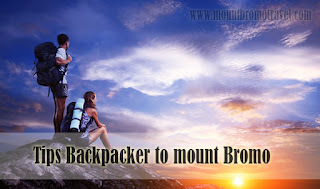 Tips backpacker to mount Bromo in Fun way is very important to know if you have a chance to go to Indonesia. In fact, Bromo is a must visit place because of its beautiful scenery. You can enjoy sunrise or sunset as well as the cold weather at night, enjoy the nature of Bromo, culture of Tengger tribe then so many thing to do in Bromo. So, what do you have to do if you want to go to mount Bromo? By learning from these tips, you can also learn about how to backpacker to mount Bromo in low budget. One more thing you should consider is about place to stay while exploring mount bromo. Interestingly, you can find place to stay from free place up to the most expensive place. If you go to mount Bromo with your friends, you can just bring a tent. Then, you can go to the camping ground. It is free there. You can also spend a little bit of your money by staying at the home stay. The price is various it depends on the type of the house. For those who have extra money, you can also decide to stay at the hotel. The next tips backpacker to mount Bromo is related to go to the peak of the mountain. You can also go to the peak of mount Bromo in various ways. The cheapest way is by walking. The scenery is good to enjoy although you will be a little bit tired. If you don’t want to do it, just spend your money to rent a jeep or rent a motorcycle in Bromo. By following those tips backpacker to mount Bromo above, you are not only enjoying the scenery of the Bromo but also doing it in cheap cost.